* Inspect the awning fabric for any tears or excessive wear. Talk to your RV dealer about what materials to use to repair or patch the awning fabric. * Do not store the awning when the fabric is wet. Allow enough time for it to dry completely, on both sides, before storing the awning. * While the awning is out, inspect the awning hardware. The bottom awning brackets support most of the load from the awning. Check the lag screws in the awning brackets for secure mounting. Inspect the arm pivot holes for any enlarged holes or broken rivets in the handles. * Check for a warped roller tube. If the roller tube is warped it will be noticeable when you roll the awning out. * Inspect the awning end caps for secure mounting and broken rivets. Caution: Never attempt to remove the awning end caps. Spring tension can result in serious injury. 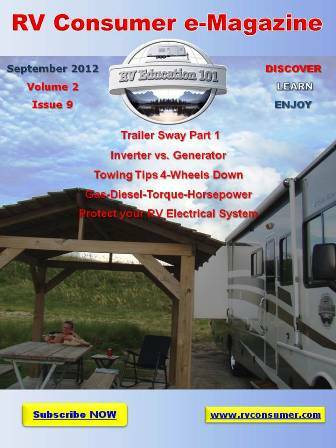 * Make sure the awning rail is securely mounted to the side of the RV. *Always lower one end of the awning to allow for water runoff. The weight from water pooling on the awning fabric can cause extensive and costly damage. * Any wind gusts over 20 miles per hour can also cause extensive damage to the awning and to the RV. Never leave the awning out unattended. If everyone is leaving the campsite, store the awning in the travel position. When you go to bed, store the awning. Even when you are at the campsite, you should use awning tie downs to prevent any sudden damage caused by high wind gusts or a sudden storm. * You have the option to position the awning arms straight down and stake them to the ground, but you will get better support if they’re attached to the bottom awning brackets on the side of the RV. Remember, it is much easier to prevent damage to your awning than it is to repair it. 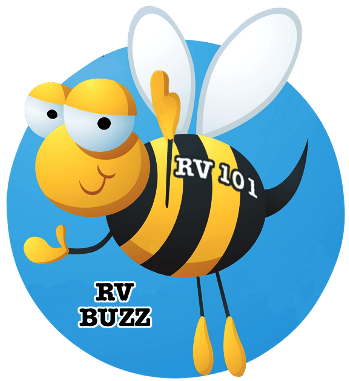 For more information on RV awnings and everything else you need to know about your RV check out my best-selling book, The RV Book.